Side By Side Stuff is excited to announce our MBRP Powersports Exhaust System Giveaway. It’s easy to enter and totally FREE. To enter just scroll down and fill out the entry form on this page. The winner of this giveaway will receive one MBRP Powersports exhaust system of their choice. 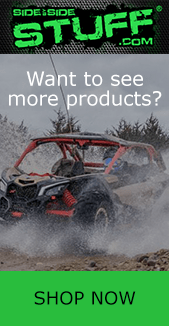 NOTE: Exhaust system and UTV application must be in stock and available at Side By Side Stuff. Browse our selection of exhaust systems from MBRP Powersports. One giveaway winner will be selected using Google’s random number generator and will be contacted via email ( using the email entered in the signup form ). Winner will have 48 hours to respond or the contest defaults to the next random pick. The winner will also be announced in our next email newsletter. Signup ends at 8:30am CST on September 11th. Even if you are already a subscriber to our newsletter you still need to fill out the signup form to be entered to win. This giveaway ended 9/11/18, BIG THANKS to everyone who participated. This would be awesome for my ‘18 Xpt! Be nice upgrade to my 18 1kxp.